Hibiscus varieties are immensely popular in gardening, and range from annuals to perennials, hardy to tropical, and large shrubs to smaller plants. When you understand what all the options are, you can pick the perfect types of hibiscus for your garden. 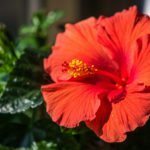 There is a huge variety of hibiscus plants with a lot of differing qualities, but they all have certain characteristics in common. These are plants that produce pretty flowers, although they come in range of colors and may be single or double in form. The flowers on hibiscus varieties only last about one day, but the entire plant flowers for a long season. Thanks to their flowers, all hibiscus plants draw in pollinators, including bees. Native hibiscus. Also known as rose mallows, there are about 35 species of hibiscus native to parts of the southeastern U.S. A popular native variety is the scarlet rose mallow, common in Florida, which can grow to 4 to 8 feet tall (1 to 2.5 m.). Rose mallows are also called marsh hibiscus, and although they naturally grow in wetlands, they will tolerate drier areas. Hardy hibiscus. These cold-tolerant, perennial shrubs can be just as beautiful as their tropical counterparts, with big showy blooms in a range of colors. A popular hardy hibiscus variety is Rose of Sharon, with pink, white, or purple flowers. Tropical hibiscus. These types of hibiscus have some overlap with the native species that grow in Florida and southern Louisiana. The most common tropical hibiscus found in nurseries is Hibiscus rosa-sinensis. Different cultivars will give you a choice of flower color and size. They can be very large and showy, with bright and rich colors. Perennial hibiscus. These are shrubs, which can range from smaller, dwarf varieties to large, tree-like bushes. The perennial hibiscus may be hardy or tropical, and include Rose of Sharon, scarlet swamp hibiscus, rose mallow, and confederate roses. Annual hibiscus. These are not true annuals, but they are tropical and can be grown as annuals in slightly cooler climates. They are often grown in containers and include Chinese and Red Leaf hibiscus. The former comes with a variety of colors, while Red Leaf is grown mainly for its deep red foliage. With so many options for growing hibiscus, every gardener in every setting can find something that will grow and thrive while adding beauty to the garden.